Benjamin Franklin's diplomatic skills were the key to another great coup for the American cause. Captain John Paul Jones had been living in Virginia when the war broke out. He went to France seeking Dr. Franklin's help in outfitting ships. He had a bold plan. He wanted to attack the British in their home waters. Jones, born in Scotland, had served on ships from his boyhood. He had even served for a time on slave ships. John Paul Jones's appearance deceived. Abigail Adams would write of him that he was nothing like the "rough, stout, war-like Roman" she imagined. Instead, he was small, slight, soft-spoken: "I should sooner think of wrapping him up in cotton wool and putting him into my pocket, than sending him to contend with cannon ball," she wrote. Mrs. Adams could not have been more wrong. Jones was a fierce combatant. "I wish to have no connection with any ship that does not sail fast, for I intend to go in harm's way," he had written. Jones succeeded in spreading panic along the coast of England and Scotland in 1778, seizing British merchant ships and even raiding seaports. Commanding Ranger, Jones attacked the seaside town of Whitehaven, less than a hundred miles northwest of London. Jones knew the harbor well. He had left England from that very port. His stunning raid sparked fear in London. All at once, the English realized they might be vulnerable in their home islands. When Franklin persuaded the French to give Jones a ship, Jones gratefully christened her Bonhomme Richard. This was the French translation of Franklin's famous Poor Richard. Franklin had been upset upon hearing of the British fleet burning Fairfield and Norwalk and other towns along the Connecticut shore. He wanted a reprisal. On 23 September 1779, Commodore Jones overtook a rich Baltic convoy off Flambrough Head, Yorkshire. The fearless British Captain Richard Pearson and his swift, copper-bottomed HMS Serapis shepherded the convoy. Pearson had nailed his blood-red British ensign to his mast that morning as he set out to search for Jones. The other ships in his small squadron soon abandoned Jones, but he brought Bonhomme Richard in close with Serapis. At his first cannon volley, a gun exploded on Jones's ship, killing many of his own men. Jones's great skill in maneuver helped him come alongside Serapis, where he used his French Marine musketeers to devastating effect. Bonhomme Richard was on fire, taking on water and likely to sink, when Pearson called out to Jones, asking if he had "struck." To strike, or haul down your flag, meant you were surrendering. Jones's reply - that they had done but a little fighting and he was determined to fight on - has come down to us as "I have not yet begun to fight!" Whether or not he said exactly those words, his actions followed them precisely. For hours the two ships were locked in a deadly embrace, "snug as two logs in a woodpile, guns muzzle to muzzle." English farmers coming home from their fields watched, awestruck, under a harvest moon as the two ships lit up the night. Both ships called for a temporary ceasefire, sending crews aloft to put out the flames that threatened to engulf them all. Serapis tried to break from the clinch, to use her superior firepower to blast Bonhomme Richard, but Commodore Jones had ordered Sailing Master Stacey to use heavy hawsers to tie the ships securely together. When he heard Master Stacey cursing a blue streak, Jones reminded the salty sailor to watch his language because he might "in the next moment be in eternity." 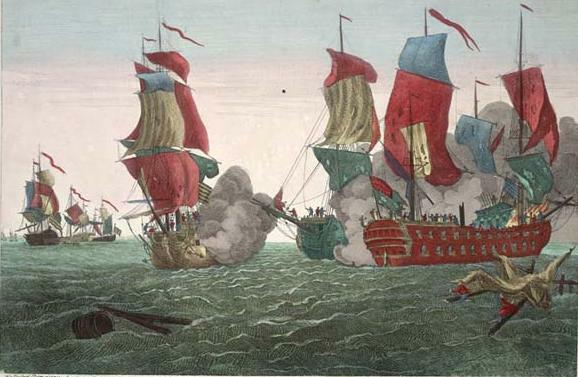 Unexpectedly, Jones faced "friendly fire" when the Alliance, commanded by French Captain Pierre Landais, suddenly reappeared. Twice, Landais's ship raked the Bonhomme Richard with deadly grapeshot. Despite this, Jones finally won a victory of the "tops" as his American and French marksmen high up in the masts completely cleared Serapis's decks. Jones was able to board and capture the valuable prize. History offers no greater example of courage and determination. Americans - long sneered at as cowards by the British - could ever after answer Bonhomme Richard. Both ships had suffered terribly, nearly 50 percent casualty rates. Bonhomme Richard could not be saved.